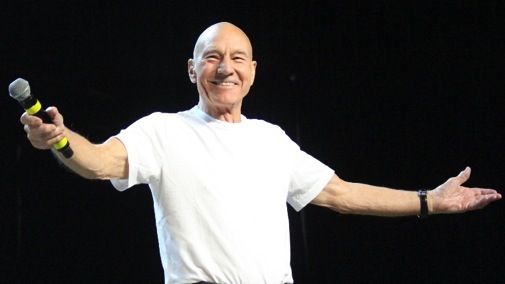 Patrick Stewart exults over playing Capt. Jean-Luc Picard again. Your friendly content provider reviewed all of the following in their original incarnations. And now here they come again to offer another whack. The oldest recently announced reboot/rebirth of them all is Shogun, one of my first big undertakings as a TV critic. Starring the then “King of the Miniseries,” Richard Chamberlain, as explorer John Blackthorne, it premiered on NBC in September 1980 as a five-part miniseries adapted from the bestselling James Clavell novel. The original received 14 Emmy nominations, including five for acting. It ended up taking home three trophies, among them the Emmy as that season’s best miniseries. It’s doubtful that Chamberlain will have anything more than a cameo, if that, in the FX re-do. But Patrick Stewart, who dared to stay bald in 1987 when Star Trek: The Next Generation became one of the biggest and splashiest syndicated launches in TV history, will be returning with considerable gusto to the lead role of Capt. Jean-Luc Picard. As with Shogun, there’s no air date yet, or announcements on whether some of Stewart’s old castmates also will be returning to Next Generation. CBS All Access already is equipped with the new Star Trek: Discovery, with a second season due in January of next year. Let’s move on to HBO’s Deadwood, which also is being born again after three seasons and 36 episodes ended their run in 2006. HBO says it finally has all of the key cast members together for a Deadwood movie set to shoot in October with a hoped-for spring 2019 air date on the premium pay cable network. Ian McShane, who will head the cast as heavily swearing Al Swearengen, will be 76 by the time shooting commences. So as with Stewart, there’s no time like the present to get these balls rolling again. FX’s Fargo, which easily has had the least time off, also will be returning for a Season 4 that didn’t seem all that likely after the third season ended its run on June 21, 2017. Executive producer Noah Hawley, who has very ably followed in the footsteps of the Coen Brothers, had expressed reservations about doing another self-standing chapter within the Fargo universe. But FX needs product after seeing its main programming provider, Ryan Murphy, sign a new deal that will take all of his new projects to Netflix. Louis C.K.’s banishment after admitted sexual improprieties also created a cavity. So Hawley will be proceeding with a fourth season of Fargo starring Chris Rock and due sometime in 2020. The setting is Kansas City, circa 1950, with Rock cast as the head of an African-American crime family that has reached an uneasy truce with an Italian gang. But “everything changes” when the head of the KC mafia dies while undergoing supposedly routine surgery. A fifth big reboot isn’t firm yet, but increasingly seems likely. Kelsey Grammer recently told Today that “we’re taking to some writers about” bringing back the critically lauded Frasier. He estimates the odds of returning as “probably about 40-60.” But Grammer insists that a reincarnation be set in a city other than Seattle, where it left off in 2004. CBS’ much-anticipated continuation of Murphy Brown is coming this fall, with Candice Bergen again playing the title character. The network also is adding Magnum, P.I. to a reboot corral that already includes Hawaii Five-0, Macgyver and S.W.A.T. And The CW will be adding a new version of Charmed while returning its Dynasty re-do for Season 2. Add ABC’s The Conners after its highly successful Roseanne reboot ran afoul of star Roseanne Barr’s Twitter feed. Otherwise the TV networks are just brimming with new ideas. Sure they are.